PHOTOS: Men dancing at the Old Telegraph Station during the Mbantua Festival was one of the issues raised by the Aboriginal Areas Protection Authority. And organisers repeatedly had to tell people to get off the rocky hill – a favourite place to explore for children visiting the OTS picnic area – behind the stages and corroborree areas. 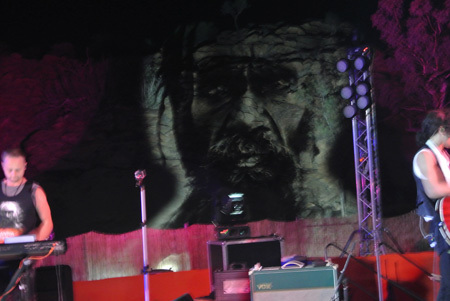 BELOW: Face of a traditional owner projected onto the rocks during the Jessica Mauboy concert. Sir – The Sacred Site fiasco over the Mbantua Festival and beach volleyball once again puts the actions of the Aboriginal Areas Protection Authority (AAPA) in the spotlight. It’s time government took another look at the Act and regained some semblance of control over this self-serving, empire building, bureaucracy. Its present mode of operation is in complete contradiction of the spirit of the act, in that it is both controversial and extremely divisive. The Mbantua incident is taking it to a whole new level, trying to out Aboriginal the Aboriginals, trying to exert rules and customs with no historical basis, directly in the face of those the Act sets out to support. Government departments and councils pander to it, giving it power of determination over decisions such as tree planting and maintenance, fire protection, sand removal, now automatically copied in on any bureaucratic decision being made. These are decisions and actions for which the AAPA has absolutely zero expertise or legislated right. Many of its actions are clearly not covered by the Act or the intention of the Act. When making a decision to leave a dangerous tree standing – such as the dangerous dead trees next to the Traeger Park grandstand – the authority accepts absolutely no responsibility for someone killed or injured by it falling. The authority claims ownership yet accepts no responsibility for ongoing maintenance. The Act’s clear intention was to protect sacred sites where it was possible to do so in a balanced manner that took into account the aspirations, economics, cultural and social advancement of all Territorians, “not defined by race”. The Act says it serves “the aspirations of the Aboriginal and all other peoples of the Territory for their economic, cultural and social advancement”. I believe the Act’s intentions were to protect such places as where corroborees were held, Tjurungas kept, special places in the corroborees, paintings, carvings, graves – not the landscape in general, not every rock, river or tree. It was never intended that the Act be a money-making concern that paid its way by what amounts to extortion and stand-over tactics. The authority has clearly been highjacked by the Land Councils to which the authority is completely subject given that the Land Council is responsible for all appointments to the board. It’s time Government had the guts and vision to take this on. The authority needs to be put back in the hands of custodians, those who have a proven historical association with the area in question. The custodians should be nominated by the people of the community and appointed by the Minister to a board that acts directly under the control of the Minister. This board should be required to sit twice yearly or more often to deal with arising circumstances in full public session, justifying its decisions. Aboriginal people and their descendants need to accept that not only people of Aboriginal descent have a close association with the land. As a third generation born and bred local of nearly 60 years I am part of and love and wish to protect this land just as much as them. While I willingly recognise and respect Aboriginal people’s greater historical association with this place I see us all as equals when it comes to rights and expectations. We are all here to stay, it’s in all of our interest to create a harmonious community. Time to drop the chip on the shoulder, in your face approach to these matters. Join hands and built a great community that loves, respects and appreciates all of us individually for what we bring to our combined community. Gee, it’s no wonder there can’t be any ‘middle road’ on this topic. Everyone seems so very sure that they’re right. It’s also obvious that a rational and calm discussion will not happen either on this topic. I think this is an accurate description of the some of the contributors to this discussion. Not quite sure which “Bob” you are attempting to patronise just now Steve (Posted October 28, 2013 at 2:42 pm), as there are at least three Bobs contributing to this thread, but if it’s me, here’s my response: I would be very pleased to see respectful processes of the kind outlined by Mr Liddle to try to help sort out these matters (such as any ignorance and obscurity about sites and their protection, inconsiderate behaviours by any parties, misunderstandings, squabbles, lack of clear information and signage, better communication etc). However I think this process would be aided immensely if you were to now issue a clear retraction of your declaration of intent to destroy the legal independence of AAPA by changing the Sacred Sites Protection Act to bring the AAPA Board under political control with “a board that acts directly under the control of the [NT] Minister”. @ Michael. That’s really good to hear, Michel, that’s the kind of direction I’ve been expecting and hoping for from you. I can only say I am very pleased. Good on you! @ Bob the whole idea of an letter like this is to promote discussion to try and arrive a different point of view hopefully a better point of view than we started with. Of course I read with great interest every intelligent comment, even yours, and yes I take them into account in my thinking I hope that readers follow the same path draw some conclusions learn some truths that perhaps they weren’t previously aware of. Good discussion is always vigorous, I give ground only when someone convinces me I’m wrong. I am always open to being convinced! Try it yourself, Bob. I see your point Steve and thank you. Arrente TOs through the services of Lhere Atepe, AAPA, CLC, ASTC and who ever else, need to meet at the table as a matter of urgency to discuss the direction to some of the Aboriginal governance issues happening in Alice Springs today and contribute to provide constructive solutions for the benefit of all in the community of Alice Springs. We are working on this now, it is hard Steve and others reading, but it will happen so we can all be aligned with procedures and protocols that everyone is comfortable with. Arrente people will take the lead in fixing them and yes, it is an emergency and I will be involved in bringing all together to discuss. So mess ups like the ones you have mentioned do not eventuate again and if they do, there are measures in place that have the circumstance covered. But as I said in my previous post. You are not required in this space of reaching good compromise sessions with the stakeholders I have mentioned above, because its all about “what you think”! Read all the posts old friend and you will see more than one person aiming comments at your constant hard-nosed babbles! I’m in “Bob’s Club” as far as protesting against current levels of alcohol supply in Central Australia. I wouldn’t mind being in Steve’s Club either, especially considering that we half-agree on a few things, but I can’t get in the door. You probably missed the fact that the alcohol industry has been increasing alcohol content in wine during the past twenty years and adding 30% more to product content in recent times, so yes, put me down for a return to the past on this issue. Why is the past such a problem for you? Sometimes in life, you have to take a step back to more forward. Your “reasonably harmonious economically viable town where there’s a good chance for everybody to live a happy and fulfilling life” never, ever, includes a sensible approach to alcohol supply reduction – as if the evidence and example of other countries and jurisdictions aren’t there and you’ve got the audacity to talk about head in the sand. “(W)e need a very good look at where and how we are going because at the moment we are headed in the wrong direction”. On the issue of the economics of alcohol-abuse and its related welfare, health and productivity indicators, I happily agree, but it doesn’t seem as if you can handle not having take-away grog available seven days a week, a floor price and a 2pm opening as just some of the options for the kind of town you say you want. Why is that, Steve? @1. Thanks for the comments Steve. Obviously you don’t realize there are many people with different opinions than yourself. I think you need to read the comments more carefully and ‘hear’ what is being said. Unfortunately you appear to have the view that people need to agree with you or they are against the idea of ‘wanting a reasonably harmonious economically viable town where there’s a good chance for everybody to live a happy and fulfilling life.’ Somehow our views don’t include this? It is true, this town needs some direction, but this won’t happen until it is realised by all parties that local traditional owners have constantly been forced to compromise their sacred sites for the ‘benefit’ of wider society – just so we can live ‘harmoniously’. Come on Steve take a good hard look at what is being said to you (by all the people commenting) before you make your next comment. @ Michel Its really easy to stand on the sidelines and throw smart comments without ever offering any kind of forward direction. I’ve been waiting even hoping for a little leadership, signs of thoughtful forward thinking from you, some rational thoughts about the various functions of our community, the directions we need to move in if we want a happy economically viable community. If you don’t want that, if you’re in Bob’s Club wanting a return to the past, have the guts to say so. If however your ambitions for our community are similar to mine in wanting a reasonably harmonious economically viable town where there’s a good chance for everybody to live a happy and fulfilling life. Then, Michael, if you are honest with yourself, you’ll be forced into reaching the same conclusions as myself, that is we need a very good look at where and how we are going because at the moment we are headed in the wrong direction. The division and Angst over sacred sites has been escalating for some time. The Mbantua Festival was just one in a long line of incidents. The really destructive incident was the recent beach volleyball incident, I know it wasn’t SSA speaking that caused it, but it is all about community perceptions. Imagine the difference that it would have made to community harmony had custodians come straight out publicly and said sure it’s alright to play volleyball in the river, and maybe given those doing it a bit of support by offering a challenge from an Indigenous team. They could have spoken about the need to respect the site and everyone would have accepted that gracefully and become a whole lot more supportive of sacred site protection. The way it was handled caused deep division and disrespect, this is what I am saying, there are two ways, one of them is harmonious and will have long term benefits for SSP the other well it has the opposite effect. I am saying that it is time the authority became more open and receptive to public comment and that it play a leading role in achieving community harmony. No, that doesn’t mean we all go round holding hands. Time to get heads out of the sand, out of the past and make some good rational judgements about direction for the SSA judgements that relate to living now, in today’s world, and to where our children will be tomorrow. In reply to your comment about peeling back the layers, my thoughts and beliefs have always and are nearly always out there in the open where people can make up their own minds. I’m not hiding Michael, and never have. What about you? It has taken this long for someone to show this town, country some of its history that some, it sounds like, would prefer to remain hidden. To those who put this together, every effort and support should be given them. It may have come as a surprise to some, that the remarks and various comment from individuals is out of line. This water hole was the reason for the Telegraph Station to be built here, in the first place. Who? Lined this water hole with plastic and why? Is another question for you Mr Scambary and why hasn’t anyone spoken before, or is it only money that opens the mouth? Yes, the event was so professionally handled that it may have put a few noses out of joint. But I do hope people have learnt something from this, in regards to security. Volunteers, rubbish collection and safety. Kids were safe. No mess – fantastic! So Mr Scambary what is your agenda and that AAPA? It certainly isn’t reconciliation. Yeah I agree with everyone that disagrees with Steve Brown’s comments. The comments Steve Brown constantly babbles about do nothing but peel back and reveal who he really is and what he stands for. There were issues between the festival organisers and members of the community stakeholders of Alice Springs(this is what the story is about). In fairness to all, we have to meet and speak to assure all so that we do not have these same teething issues raised again so the Mbantua Festival can be a success for the whole community of Alice Springs,for everyone to enjoy and it has huge potential to be a great success. Steve never mind how clever you are, your presence is not wanted or needed to participate in developing good events that help build our community for all ages, sexes and races to enjoy! It is very sad to me to see the sort of derisive self serving language of moral panic Steve Brown chose to use in his original letter, and that others have adopted to support his case in this thread. I am a so-called sixth generation Australian, and yet recognise my cultural origins as Celtic Irish and Anglo-Irish. I live in Mparntwe, and yet do not claim it as mine. I have the great fortune of knowing, and love and respect very deeply its Apmereke-Artweye, and we have in the past worked closely together. Steve refers to chips on shoulders and in your face behaviour as barriers to our shared future and yet, the chips are clearly his, and the only in your face behaviour I can see here is Steve’s. I applaud Sasha, whoever she is, for her response. It could have been mine, but I missed all this bar humbug – busy contributing, sorry Steve … TO, again, coherent and calm. I thank for making that crucial point: Steve, Arrernte Country is not ours … and finally, Matt and Bob, for identifying the gamesmanship of Steve’s debating style. It’s abusive, bullying, corrosive and ignorant: classic ‘my way or the highway’ paternalism. I believe the AAPA clarified the procedural issues that provoked this tirade. I’m sure as a councillor Steve can grasp the concept of procedure … or rather, one would hope. Oh, and by the way Steve, I am not a Marxist, and never have been, though I do remember reading some of that rubbish at University many moons ago. Does that make me intelligible to participate in this public discourse? I wonder which ad hominem [attack on the person, not the issue] approach you will use to avoid Sasha’s questions, and undermine my position here. So, down to business. Steve, the Act was followed, AAPA certification issued with relevant conditions, the festival occurred, so what are you complaining about? Sounds like a poor little white fella whinging to me. Or have you another agenda? Maybe you want to delegitimise Mparntwe Arrernte from asserting rights in land and law, that both the Commonwealth and Territory governments and courts have already acknowledged? You mean they got it wrong Steve? You mean, not even the High Court knows its law as well as you? Or are you after maintaining the us and them discourse, us – white fellas knowing what’s best, and them needing to assimilate into submission? Hah! Oh yeah, the progress discourse: How’s the progress of the couch and the buffell out your way going Steve? Great progress. What depresses me most is that the community at large has to listen to, and read, this sort of culturally ignorant rubbish, from people who, by virtue of their opportunities to learn, should know better! PS: When I was a girl I rode a skateboard too! Yikes! I must the Devil! And am I mocking you Steve Brown? You bet! How could I not? Surely, you’re taking the proverbial yourself, aren’t you? It seems to me that Steve Brown has opportunistically picked up on a division in the Aboriginal ranks to launch a cluster bomb of divide-and-conquer accusations in his letter and other comments here (see Steve’s letter above, and his comments on this thread: Posted October 24, 2013 at 6:01 pm; Posted October 25, 2013 at 8:36 am; and Posted October 26, 2013 at 9:48 am). Steve’s main purpose seems to be to commence a bald attempt at destroying the legal independence and practical effectiveness of the NT Sacred Sites Protection Act (SSPA) and its administrative arm, the Aboriginal Areas Protection Authority (AAPA) by bringing it under political control. (See Steve’s statement in his October 23rd letter: “The custodians should be nominated by the people of the community and appointed by the Minister to a board that acts directly under the control of the Minister”; and his comment on this thread Posted October 24, 2013 at 6:01 pm). The governing Board members of the AAPA are currently appointed by the NT Administrator under arrangements jointly guaranteed by the Commonwealth Parliament, the NT Administrator and the NT Government. Steve demands that the AAPA Board be deprived of its independence and made subject to the will of an NT politician. In pursuit of this objective, Steve goes for the jugular, reducing the Sacred Sites Protection Act to a ‘straw man’: the dreaded ‘self-serving, empire building, bureaucracy’ of every CLP politician’s and developer’s nightmares. Steve’s portrait of AAPA is a ridiculous mischaracterisation of the organisation. I have seen AAPA’s work at close range over much of the thirty years of its existence. It has a very good track record, and has acted with great professionalism, and with respect to all parties. (There are always going to be dissenting views in the community about some of these issues by disgruntled parties, both Aboriginal and others. It comes with the turf). Far from being self-serving or empire building, AAPA is governed strongly by a board composed of 10 grass roots traditional owners (TOs) and two NT Government appointees. The 10 TO representatives on the AAPA Board are appointed to their positions by the NT Administrator, from nominations made by more than two hundred representatives of all the Aboriginal traditional owners in the NT, at meetings convened by the four NT Aboriginal land councils. These board members take their roles and responsibilities very seriously. The 10 community-nominated board members feel a very heavy duty to honour the faith of those in the Aboriginal community who have entrusted them with the extremely difficult role of attempting, in an era of great change and pressure for all kinds of development, to protect sites of significance to Aboriginal people who follow their traditional religious teachings, beliefs and practices. The board members have to perform this difficult task whilst at the same time considering, and balancing them with, the rights and needs of other parties. Apparently in Steve’s eyes, protection of Aboriginal sacred sites can’t be valid or effective if it is deemed ‘controversial’ or ‘divisive’ by some people – conditions he is doing his utmost to incite and inflame. It is difficult for me to imagine how the AAPA could possibly do its job if it didn’t, to some extent, cause a degree of frustration to at least some of our many developers, negligent or less than perfect land managers, and their ideological spear carriers. Your appeal to the “necessity” for the “preservation” of Aboriginal culture(s) by balancing “others doing other things … to make allowances for and to get on with each other” can only work if direct conflict is resolved. It’s an appeal to tolerance, reason and common sense, values associated with the failed Enlightenment experiment where the moral relativisim of secular Western democracries hold sway, in this case, against Aboriginal cultures on a dissembling frontier. In the courts of Australia and throughout the world, these values are being challenged, but in the “failed state” of Central Australia, we have a problem with alcohol that is, per population, one of the highest anywhere on the planet. There is no point trying to get on with each other when the NT government is permitted to foster a climate of alcoholism and then create rehabilitation centres in which nearly every inmate is a member of those “other” Aboriginal cultures. If it weren’t such a tragedy, it would be a joke. Your complete lack of support for decreasing the supply of alcohol in Central Australia does not invoke confidence in you as a peacemaker. Your position as a local government official who pleads with the NTG to show “guts and vision” in the ailing tourist industry is called into question by your lack of guts and vision against the biggest social problem in a region of which you claim six generations of tenancy. You recently accused “TO” of having views that were “unhelpful to anyone”. A little focus on the biggest social indicator of division would be helpful. Once again Steve, name calling, presumptions and judgements that most likely reflect yourself rather than those you attempt cast them on. If only you put as much into your role as a Councillor as you do into letter writing and then did some meaningful research you might actually do something in this term you have been granted. Majority not so sure Steve, seems like the silent minority skulking in the shadows, reminiscing about the good old days, watching their elected ones flounder. Like I said, Steve, thanks for the comedy, don’t take yourself too seriously. No-one else does. Praise be to Sasha (Posted October 23, 2013 at 7:48 pm, and Posted October 25, 2013 at 5:41 pm) for speaking up loud and clear, with excellent knowledge of the subject and the ability to speak directly to our concerns. If only there was more of that kind of well-informed talk on these type of issues by people like her who have had deep experience of working in the field in recent years, then we would have much better informed debates and discussions about these issues in the public media spaces of central Australia. Thanks for making the effort Sasha, and thanks to all the others who have contributed constructively and knowledgeably to this thread. @ Bob: Nowhere in what I am saying am I either speaking against the preservation of Aboriginal culture or for that matter sacred sites. What I am talking about is the necessity to do that in the same space as others doing other things, to put it simply, to make allowances for and to get on with each other. I suggest you take a look around you. Unless there is a world calamity of mega proportions human population will force greater and greater populations into places like ours. Sitting just to the north are populations of refugees that could more than double the population of the NT overnight. Preserving culture will become increasingly difficult. Give yourself the best chance get the general population on side! You don’t do that by getting in their face! @ Matty Day: Your comments remind me of a petulant child who didn’t get their way! I have some serious concerns about anyone who works with youth who encourages kids to be rebellious, to see themselves as some kind of surly sub culture. In this article Matt we are talking about real culture not a couple of selfish thrill seekers who think they have some kind of right that others don’t, simply because they ride a bloody skateboard. In any community we have to balance the wants of individuals against the best outcome for the majority. Why don’t you spend some time talking to kids about that Matt? Teach them respect and consideration for their fellow community members. If I still had kids skating I would hold grave concerns about the sort of attitudes you may be teaching. I suggest you have a rethink. Your comments should be of great interest to the parents of skaters. Oh and Matt, tell us why you only asked Ray for his second name? Sounds like Steve wants to become a “Loopy Lefty DoGooder” now! Holding hands Steve, really? The only hand holding you’ll get, is to walk you around the CBD, so you don’t get too scared of being hit by all these skateboards that you reckon are killing people in the Mall. Thank you Sasha for your well researched and considered response. Out of all these comments, Steve you don’t realize what is being said. Arrente people and the 6-8 other language groups in Central Australia need to conserve what is left of our culture, (as for the rest of the country has none left). We do not want any more people coming to live here in Central Australia and would prefer more people left and returned to other states (or back to their own bloody countries). We know we may die out eventually and then you can do whatever you want with our mineral rich country and all its glory. It’s really hard to take any you say seriously Steve, you appear to think you are the resident expert on everything. It pure comedy. The statement below contradicts your overt views on the youth being allowed to access the town they stay in! One might even think Steve Brown and integrity are “mutually exclusive”. And Ray, why don’t you publish your last name? Steve (Brown). I rest my case. @ Sasha: You obviously struggle to think outside of what is written in front of you, the perfect bureaucrat I guess, that’s OK, somebody has to undertake that role. However, try and understand that the only part of the act that is important is the intent. It is meant to be read in conjunction with every part of the act. The outcome from the act’s implementation is supposed to be in keeping with it. I am saying to you and others that this is not so! Acts don’t come down from heaven, Sasha, nor do intentions. They are put together by people and can be rewritten or removed all together at any time. I have no issue with your photo. My reference was to your age. Your photo, if it is up-to-date, would make you much younger than me (and much better looking). Going back to your first comment, Sasha, you don’t seem to realise that everything you wrote simply backed up what I am saying. The fact that it has deteriorated into infighting between the CLC and the AAPA neither surprises or interests me, in fact it just confirms my belief in the complete breakdown of the act especially if the CLC is issuing their own clearances. The Act needs revisiting urgently. Thank you Sasha for helping to make that clearer to all. @ Sensible Steve, what a joke that name is. What’s your contribution to anything mate? Please enlighten us all! @ Sasha, posted 25 Oct. 5:41PM. You’re not alone in being verballed by Steve Brown. He accuses Bob Durnan of having “the sheer insulting audacity” (‘Newcomers, FIFO crowd tear the heart out of Alice’ – posted 24th Oct. 2: 05PM) and “TO” of “shame for those around you, including the community” whose views are “not helpful to anyone” (‘Get the AAPA into line’ – posted 25th Oct. 8:36AM). Thanks to Mr Brown’s audacity, we’ve all been stitched up, but I’m not feeling insulted. I thought Steve had given up on me. Three generations eh Stephen? I’ve certainly noticed the Brown Dynasty influence as I walk around with raised eyebrows. Local? You need to get out a bit more … sounds like big fish, small pond. Your reply to my comment demonstrates your inability to participate in a rational conversation based on fact. For example: I’m not sure from whence you drew the following conclusion: “… your misguided belief that somehow you have more right in this place than others”. Please identify where in my previous comment I wrote anything of the sort? I didn’t say anything of the sort. In fact, YOU just made that up! When challenged with the facts, you respond with gibberish. Your comments about the Act reveal that you cannot even string together a decent, well-thought out rebuttal, based on what’s really in the legislation. I doubt you’ve read any further than the description of the Act. If you have, then why not actually WRITE something that refutes my statements? All you’ve done is responded with nonsensical opinion. And what do you have to say about AAPA being in bed with the CLC? Did you even bother to check the information I gave you, information which directly contradicts your original letter? Not once did you respond to anything I’ve written with anything approaching a convincing argument. I gave you references. You pooh-poohed or ignored them. If you’ve actually read the Spencer and Gillen book, then perhaps YOU should reread it instead? Also, you seem to be attacking me because I am the ONLY commentor here who shows their face. Is a woman not allowed to show her face online? Lovely how those who talk about ‘division’ really mean “Aboriginal people are hopeless and the only thing going for them is what whitefellas brought and the only way forward for them is to be like whitefellas”. Pretty clear to me where the ‘division’ is coming from. @ TO. You don’t put your name because you are hiding, lashing out with views that you know are unhelpful to anyone. It’s a shame for both yourself and those around you, including the community, that you choose not to participate in some useful way with the world, the world you could see around you if you had your eyes open. Your attitude offers nothing that will help either yourself or Aboriginal people – move on. Fortunately I am aware that amongst Aboriginal people of foresight and quality your views are treated with the contempt that they deserve. I’ve got a little news for you, you live on a Planet called Earth every single one of us is “Indigenous” to it! You’re just one of the Mob! One of seven billion. As for citing the United Nations you mean that mob who stood by in Rwanda, Kosovo, Libya, Syria and dozens of other places around the World? Maybe you should spend a little time and read about those events, it might help you get a better perspective of who you are and just how much you matter and maybe grasp the absolute necessity for all people to work very hard at tolerance and harmony. Another bit of news for you, the word Indigenous doesn’t mean free ride. What’s your useful contribution, TO? No one that I know is trying to deny the cultural significance of the trees and rocks and river, but many object to any claim of exclusive cultural ownership. Just because a grandmother walked naked in the Todd does not grant exclusive ownership. We all have or had grandmothers, and they all walked somewhere. Go back far enough in time, and they all walked naked, too. But there is no going back. We are where we are and when we are, and all attempts to keep Alice like she was when she was young and so were we are destined to fail. There are no foreigners here, and respect, like racism, cuts both ways. Steve, you are grasping at straws. My identity to you is not important, your identity it seems is what is in question. You do not belong here (as you say), you are a descendant of immigrants who in reality only have very little association or say on what happens on Arrernte country. This fact should be taken into account before you post any opinions as to how Arrernte people’s country should be used, protected or developed. Unfortunately, as widely educated as you claim [to be], you should read the UN’s ‘state of the worlds Indigenous People’. FYI it says ‘without recognising the rights of distinct people within their boarders, states cannot possibly claim to respect social justice and ‘democracy’ (as you so kindly mentioned)’. 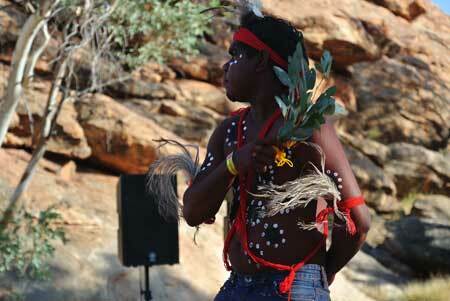 What this means is that on a local scale, Arrernte people exist here and always will. We will always be different to ‘mainstream’ and will take pride in doing so. Our culture, language and protection of our sites is up to us and does not require the intervention of people like yourself who really have no respect of that fact. Not only that, we have legislation in place to support us and with the assistance of AAPA or the CLC we will exercise our rights to continue our culture and heritage while remaining separate to the mainstream culture you view as so critical for us to become a part of. Assimilate for the greater good? I don’t think so. There was no “town” before Europeans. Witchcraft healthcare. No hospital for the Arrente and other “Centralian” mobs. No supermarket. No electricity. No welfare. No money. No jobs. No tap water. No contact with the world. Nothing but what nature “provided”. Which is really bugger all in Central Australia. I truly doubt most people want to return to that. Life is truly dire in many remote parts of Central Australia. The rest of the country is prevented from seeing it as it is, for fear of “cultural” issues, like photography. Having seen it first hand, I have seen nothing like anywhere in Oz, not even in 3rd world parts of SE Asia. Sometimes I really think some Aboriginal communities are destined to die out, if strangled by “cultural” dictat. So many Aboriginals want a better life and are held back, not only by the Aboriginal community’s own failings, but also the narrative of victimology which is now so inculcated it is part of Aboriginal identity. Another “victory” for the Left, with their beloved university driven Marxist attacks on “identity”. I hope for the day when some Aboriginal leaders will come forward and lead the way to prosperity. As it is, not much is happening in Alice. Interesting how people who are talking down Aboriginal people and the weak safeguards that AAPA gives them blame others for division! Surely we can all talk about this sensibly, using facts, without name-calling and accusing others with a different view of “creating” division? Yeh, Sasha, your comment pretty well reflects all the attitudes and ignorance that have led us to a very unfortunate place. The act is a set of rules that are set out to achieve the “intentions” of the act. It is my belief that the act, drawn up some years ago, has not achieved this, that it has in fact gotten way off track and is leading to deeper and deeper division in our community. Every word in your comment confirms this, from your statements about the incorrect operations of the act to your misguided belief that somehow you have more right in this place than others. This rather sad and very shortsighted attitude is completely wrong; we are all equal people here, even if we arrived yesterday! I believe in the preservation of sacred sites and wish them preserved when and where it is possible to do so, the overarching interests of the “whole community” being the determining factor. As people of today’s world in a democratic country we can decide at any time to change the act to bring it in line with today’s expectations. I think most of us would agree that we have failed miserably in achieving the original intent. @ TO: You are way off track. I’m not talking about developing anything on sacred sites. I’m talking about changing attitudes that are dividing our community. I just like you belong right here, the difference is I don’t question your right – I acknowledge it. I suggest you think about doing the same and if you and Sasha want to be taken seriously, use your names. By the way Sasha, if that is your real name, if your accompanying photo is also accurate I had read Gillen and Spencer several times before you were born. And no matter what our history, we are all only allotted one life time there’s nothing we can do about things gone by. We can only try and do something useful for tomorrow, and preserving misery hardly cuts it, I reckon. Thank you Sasha for putting this argument back on track. Steve, you seem so proud of being able to say you’re a ‘3rd generation centralian’. In the great scheme of things that means nothing to people who actually come from Mparntwe and want their rights and culture protected. The Native Title Process and subsequent victory traditional owners had in court allows us to defend our rights and personally I’d hope we continue to do this in a more stringent manner than we have previously and stop ‘development’ at the expense of our cultural heritage. We have been forced to share this town with non-Aboriginal people for over a century and Aboriginal people from communities who do not belong here. Terry, Apmereke-artweye and Kwertengwerle for Mparntwe and its surrounds are deeply affected by the state of the town today and the way ‘visitors’ (including yourself) treat our country. If you guys are so ‘pro development’, then move back to Sydney, or Melbourne, or somewhere where traditional owners have no say in how their country is developed because of the unjust legal systems that exist in this country. And if sacred trees are as expendable as you make them sound, Steve – then maybe put the shoe on the other foot and wonder how you would feel if churches, war memorials, houses etc were under the same threat and consider how you or others would feel if we just wanted to bulldoze or destroy them all for something of our benefit? Might be time to stop and think, and undertake some sort of research to educate yourself on the complexities of Aboriginal culture. Dominant culture (yours) is not better than, nor should it be afforded more rights than ours. I do not know a single child who has grown up in Alice and not climbed on the rocks across the river at the Old Telegraph Station. They were never being disrespectful, they were merely being children. Get over it. Like the recent kerfuffle over the entirely innocent beach volleyball games. The only disrespect shown in that sorry episode was when the original complainant referred to those playing volleyball with the thinly disguised racist term of “foreigners”. That play added such value to our Todd River and to the entrance to our town. It’s a pity it was forced to stop. And by a woman, no less. In the days when the culture she says she is protecting held sway in Central Australia, had a woman attempted to exert influence on a men’s sacred site, she would have been knocked on the head. And why has the bicycle and pedestrian circuit of the Todd River remained unfinished where it passes under Meyers Hill? The resulting Bridge to Nowhere is a fitting memorial to AAPA. Emphasis on authority, forget the protection. 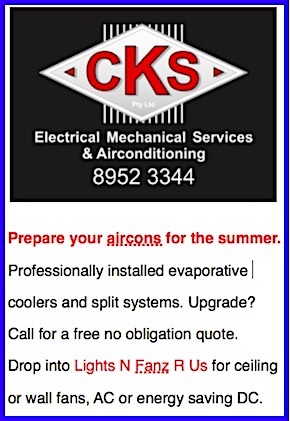 Power politics at its very worst – it takes you nowhere, gives you nothing and charges double. I agree 100% Steve. We all live in Australia, and for the most part we are all Australians, so why this segregation? Why allow one group access to a part of this great country and not another. Do native Australians (Aboriginal) require a permit to enter or cross huge tracts of our country? No, so why are those that came later required to do so? 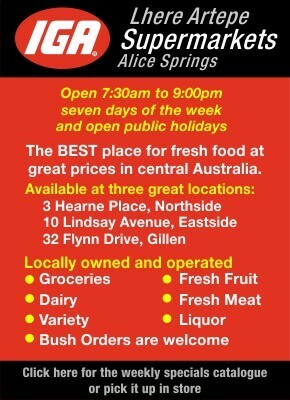 Do the native Australians “respect” Alice more than we do?. History says not. Take a look at any mission, or any camp to find the answer to that question. It’s time for the administration to take a long, hard look at where Australia is heading culturally. I’d suggest a more thorough reading of the NT Sacred Sites Act so that you understand that, oh yes, the AAPA DOES have the legislative authority that you’re claiming it doesn’t. I’d start with Section 10 of the NT Sacred Sites Act. It’s set out in neat, short, numbered points. Then, I’d move on to Sections 19 and 27. The NT Sacred Sites Act has teeth. More teeth than you seem to comprehend. Ok. You have a very limited understanding of what sacred site is – so I’m going to help you out. I refer you to the work of Spencer and Gillen – The Arunta, Volume 1. There is a drawing of the entire landscape of Alice Springs – and the density of sacred sites within the town area – drawn over 100 years ago (this predates your family’s residence here, I believe). The maps start on page 88 of the book. You’ll be pleased to know that there are so many, many sacred sites in Alice Springs, it takes Spencer and Gillen an entire chapter to describe them all. The book is in the Alice Springs collection, in case you don’t have a copy. Go check it out sometime. Pay particular attention to the “rocks. rivers, and trees” that people identified as sacred sites over 100 years ago, too. Also, I think you could benefit from some basic lessons in Arrernte kinship and land ownership … that way, you’ll be able to understand the difference between any random Aboriginal person and the actual apmereke-artweye – the Traditional Owners and custodians of Alice Springs. They are the people the AAPA MUST consult by law – check the Act. Not Neville Perkins, not native Title Holders or Lhere Artepe. Has it even occurred to you that the real Traditional Owners of Alice Springs might have found the very idea that ‘other’ Aboriginal people not only expected – but felt it was their right – to be able to hold a festival on someone else’s turf slightly offensive? How bout I come and hold a big party on your land – and sorry, but it’s promoting culture, so you can’t really say ‘no’? Well, that’s how some Mparntwe-arenye felt about the Mbantua Festival. As for your comments about AAPA’s relationship with the CLC … what a JOKE. You have no idea. If you did, you would know that for the entire 34 years of the authority’s existence, the CLC has lobbied, campaigned, pressured governments of all persuasions to repeal the NT Sacred Sites Act; has actively opposed, lied about and attempted to destroy the AAPA and its protection of sacred sites. So deep is this hatred, that the CLC refuse to collaborate or even acknowledge the AAPA, and in fact, issue their own ‘sacred site clearances’ to clients, which ‘purport’ to give protection under the Sacred Sites Act … even though the authority is the only body which can legally give such protection! But don’t believe me … I refer you to the 1997 Reeves Review of the ALRA. The seething hatred of the CLC for the AAPA is more than apparent in the pages of this document. And if you don’t believe, me just call the CLC and ask them what they think of AAPA. And whilst you’re at it, why don’t you write to the AAPA and find out how many sacred site clearances they actually declined in a year, thus standing in the way of economic development? Why not get some factual evidence to better facilitate your arguments? Surely you’re not afraid to do that? Ok. I’ve given you some primary sources, now get your glasses on and do some real research instead of simply writing emotive, poorly researched OPINION that appeals to people who worship ignorance. Be careful Steve, you’re making sense.